One welcome change in Mayor Michael Bloomberg's preliminary budget is a more accurate count of New York City's enormous municipal workforce. It turns out there are even more city employees than anyone previously thought -- ironically underscoring just how little Mayor Bloomberg is initially proposing in the way of agency workforce reductions, despite all the talk of budgetary "pain." Rather than identifying the size of the workforce as part of the problem, the new mayor benignly characterized it as evidence that New York is simply "more compassionate" than other cities. This kind of compassion doesn't come cheap. Under former Mayor Rudolph Giuliani, the Office of Management and Budget had reported a full-time equivalent headcount that excluded part-time, seasonal and per-diem workers -- a category that has skyrocketed in recent years. The last official city headcount was 250,000, but the Independent Budget Office recently estimated that the total was more like 288,000, once all the part-timers were included. The Independent Budget Office's estimate, it turns out, was still too low. Bloomberg's preliminary budget revealed there was a total of 306,000 city government full-timers and full-time equivalent as of December 31. This does not count 57,000 city-subsidized workers who work for the Health and Hospitals Corporation, cultural institutions, libraries, the Housing Authority and the School Construction Authority, and whose salaries are subsidized by city funds, but are not considered part of the city government workforce. The new, recalculated headcount reflects an increase of 17,000 city government employees since June 1998. Nonetheless, the mayor has targeted only 5,000 to 7,000 city positions for elimination in the next fiscal year-- a token reduction in the neighborhood of two percent, to be accomplished entirely through early retirement incentives and attrition. Most significantly, Bloomberg says he will "avoid" layoffs in the year ahead. In tone and substance, this is a pretty sharp contrast with the preliminary budget offered eight years ago by then-Mayor Rudolph Giuliani. Faced with a projected 1995 gap of $2.3 billion, Giuliani targeted 15,000 jobs for elimination -- and pointedly refused to rule out layoffs. In fact, the excessive size of the city's workforce, and the need to reform work rules and boost productivity, was an insistent theme of Giuliani's first budget presentation. For all his tough talk, Giuliani ended up winning only a few significant concessions from labor. Wage freezes the unions reluctantly accepted during his first two years in office were achieved only at the price of costly catch-up raises over the next three years. To make matters worse, Giuliani during his final term allowed the workforce to begin growing again. His last budget would have brought the official full-time equivalent count (excluding part-times) to an all-time record level, before the events of 9/11 forced the city to adopt a hiring freeze. Bloomberg's preliminary budget, quite unlike Giuliani's, stresses the theme of "cooperation" with the unions. 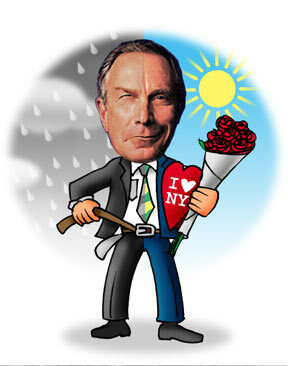 But the city's unsettled labor agreements are a potential time-bomb that may yet blow up Bloomberg's budget. Members of two of New York's three largest municipal unions -- United Federation of Teachers and the Patrolmen's Benevolent Association -- have been working without a contract for the last two years. The United Federation of Teachers is now at an impasse with the city, and the Patrolmen's Benevolent Association seems irreversibly headed to testing its newly won right of binding arbitration before a state labor board. City firefighters are in a sort of limbo, having indefinitely put off a vote on their tentative contract after the tragedy of 9/11. Bloomberg's budget includes a collective bargaining reserve sufficient to retroactively grant teachers, firefighters and police officers the same general deal that other uniformed and civilian employees reached last year -- salary increases of roughly 8 to 9 percent over 27 months. But following Giuliani's lead, the mayor's preliminary budget sets no cash aside (visibly, at least) to cover any collective bargaining agreements for fiscal years 2004 and 2005, when city budget gaps are projected at $2.5 billion and $2.9 billion, respectively. The budget also sets a target of $500 million in savings from "fringe benefit cost containment." However, according to the mayor, at least half that amount would come from stretching out the increase in city pension fund contributions needed to pay guaranteed cost of living increases to retired workers, which hardly meets the definition of a productivity improvement. That leaves about $250 million in other possible union givebacks, which is not an especially large figure in the context of more than $17 billion in annual direct compensation costs. In effect, Bloomberg is turning the city's empty pockets inside out, hoping that the unions will get the message and respond accordingly. Unfortunately, the contentious history of municipal labor relations in New York seems offers slim grounds for optimism on this score. For example, as many observers saw it, the unions were not especially helpful to their erstwhile ally Mayor David Dinkins in the early 1990s, when he faced a fiscal situation nearly as bad as the one that Bloomberg now confronts. And Dinkins, unlike Bloomberg, was willing to raise taxes -- which usually tops labor's list of necessary mayoral responses to a city revenue shortfall. Time will tell, perhaps sooner rather than later, whether Bloomberg's conciliatory tone gets more out of the unions than Giuliani's more outwardly confrontational approach. In the meantime, the collective bargaining issue continues to tick away. E.J. McMahon is a senior fellow for tax and budget studies at the Manhattan Institute's Center for Civic Innovation and publishes his regular budget analysis on http://www.nyfiscalwatch.com.